This week is Forgemaster Constructed! 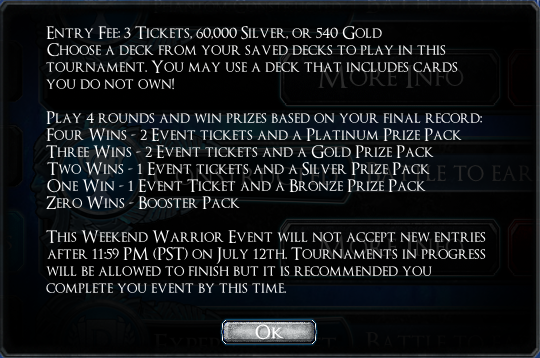 Normally that would be a great thing, since two tickets to enter with normal prize payout is an exceptional deal if you don’t have to own the cards. But it costs THREE TICKETS to enter, so the entry/prize payout is actually very bad. Please do not play in this event if you are capable of playing in the Constructed Queues instead. I chose to play in this event knowing it was bad value because I wanted to record a few decks and get cards for my F2P account. If you have don’t have ulterior motives like “providing content for the community”, I would suggest you stay away from this Weekend Warrior. In the first round, you wouldn’t have lost. Worst case scenario, is a lvl 3 roaming warclaw in front of Wegu and lvl 3 Bron on the raptor, so you end at -45 and he ends at -43. A lvl 3 Thundersaur in front of your Wegu would also mean you don’t deal enough damage, since you’d be at -27 and he would be at -20. Don’t think he had any dendrifies either, so you would have dealt enough damage to him to win. Worth taking the turn to find out. You’re right, I should’ve played a bit more and found out.